This scanned image of Taylor Hall does not indicate the presence of text on the reverse side. 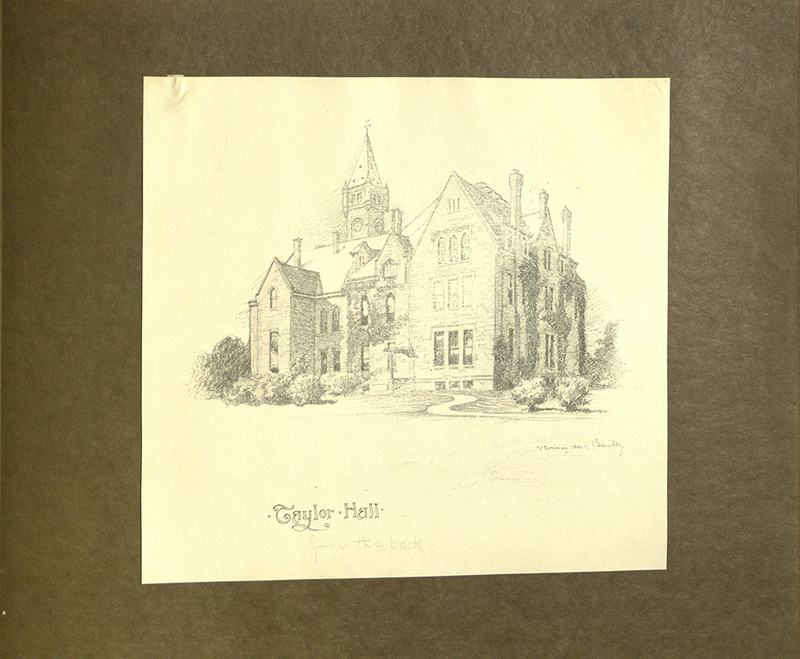 Though Marion Frost decided to show this side over the text with a description of the academic building, the description of Taylor on the reverse serves as an indicator of it's function and history. While the digitized version of Marion Frost’s scrapbook serves as a fantastic starting point in terms of examining this piece of historical evidence, it does not reveal the full effect of Frost’s work. For one, certain images designed to be flipped over -- evidenced by how some pieces were not completely glued on -- were not included in the scan. Thus, the digitized version does not reveal relevant indicators about the materials themselves. Extra light was let in by the scanner on the left side of this page. This obscures the featured photographs, especially the one on the lower left side of the page. Additionally, the scanning process altered certain images printed on glossy paper. On page 30 of the digital version, extra light was let in and consequently, skewed and altered the content of the images. Therefore, viewers of the digital version are not able to fully appreciate Marion Frost’s work – unfortunate given that this scrapbook was meant to resemble a portfolio. Marion Frost's pencil marks in these images cannot be completely appreciated due to the scanning process -- unfortunate as these were meant to be appreciated as pieces of art. Lastly, the digital version does not allow the viewer to fully examine the material quality of the scrapbook. 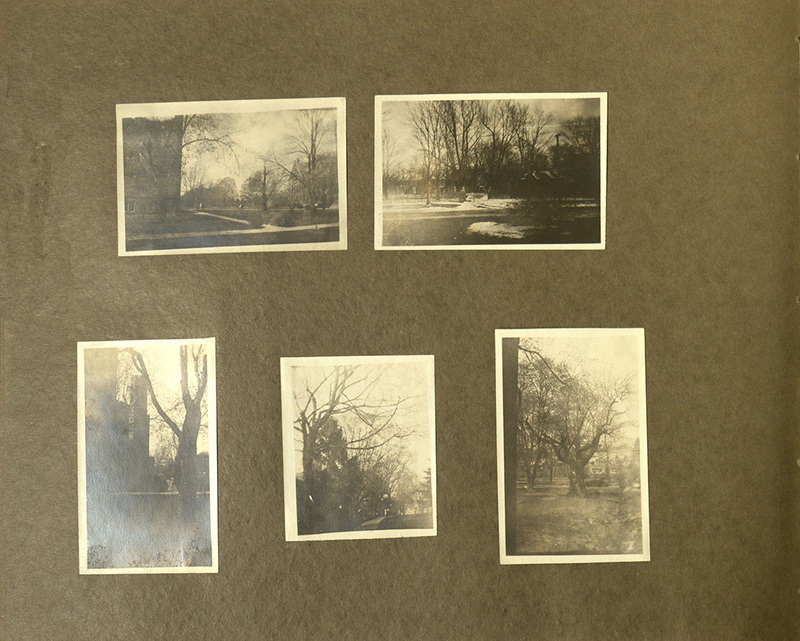 While the digitized images lend some indicators as to which images were printed on glossy photography paper, the appreciation for the different techniques and modes that Frost used to capture her campus get lost in the mediation of her work through this mode. 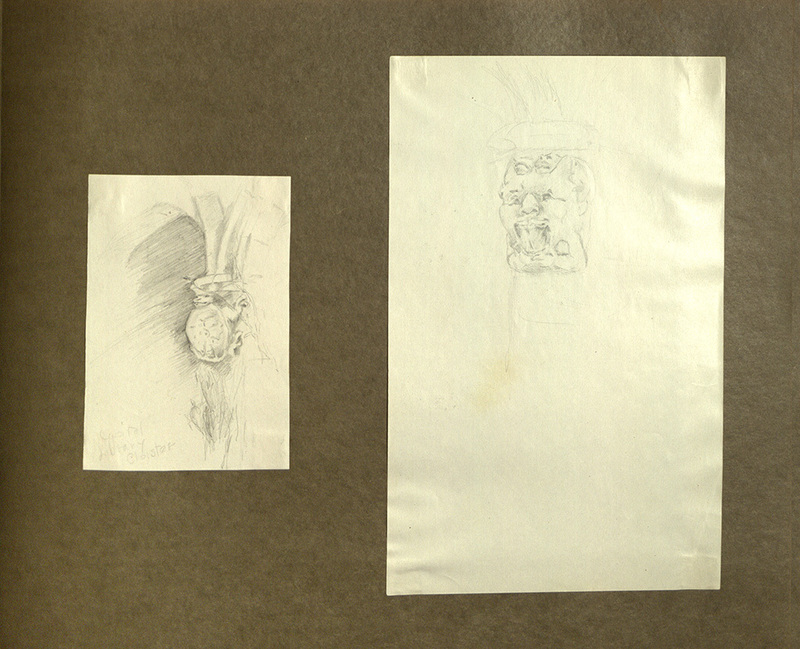 Further, the digitized images of Frost’s sketches do not reveal the detailed pencil work involved in creating these pieces of art.